Mature Movers 8 years and growing! Mature Movers began back in 2008 in Navan Pitch and Putt Club. 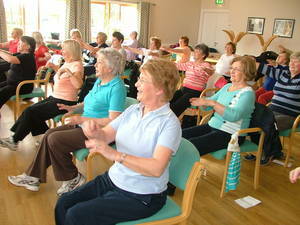 The programme was set up to get older adults more physically active. The programme runs for 8 weeks and includes activities such as movement for life, resistance training, core stability, balance, seated Pilates and bowls. In 2008 we started with 15 participants, the initiative has steadily grown and by 2011 we had 45 participants enjoying the programme in Navan, following the success in Navan we expanded to the Trim area where had 35 participants. 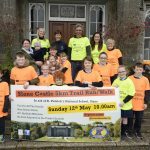 In 2012 the programme was expanded further with another 3 new venues in Summerhill, Kilmainhamwood and Carlanstown. 2013 has been a hugely successful year for Meath Local Sports Partnerships Mature Movers Programme. Over 250 older adults have participated in the programme. In 2014 Mature Movers was rolled out in 7 areas in the county and there was 300 older adults participating on the programme. 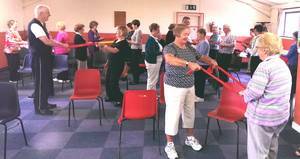 Picture Above: The older adults in action from Mature Movers in Navan. 2015 has been another successful year for the Mature Movers Programme. We expanded the programme to 3 new areas, the older adults initiative is now been delivered in 10 areas across the county. Cormeen – Wednesday 16th January at 11am in Cormeen Sports Hall. Trim – Monday 21st January at 10am in Knightsbridge Nursing Home (Village Hall). Navan – Monday 21st January at 11am in Navan Pitch and Putt Club. Kells – Thursday 17th January at 10am in Kells Peoples Resource Centre. 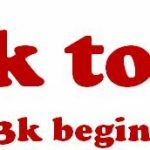 Athboy – Wednesday 23rd January at 11am in St. James Hall, Athboy. (Starting in September). Laytown/Bettystown – Friday 25th January at 11am in St. Colmcilles GAA. Stamullen – Wednesday 23rd January at 12.30pm in St. Patricks GAA. Dunboyne – Friday 18th January at 10.30am in the Old School, Dunboyne. Simonstown – Friday 18th February at 11am in Simonstown GAA Centre. Donore – Monday 21st January at 2pm in Donore Community Centre. Ashbourne- Wednesday 23rd January at 7pm in Community School Hall. 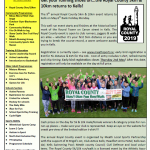 So if you would like to participate on the Mature Movers Activity Programme in your area please contact Ruairi Murphy at Meath Local Sports Partnership on 046-9067337.